The Jungle Cruise, regardless of which coast your jungle perch calls home, has a long and storied history, and this is even before we get into the backstory! However, one of the most dramatic changes to the voyage down mysterious rivers came in the 1990s when Disneyland’s Jungle Cruise needed to make some substantial changes in order to accommodate the arrival of a certain doctor of archaeology. My first thought was to regale you with the tale myself, but once you read how Disneyland themselves described the reworking of the classic attraction, simply nothing else will do! 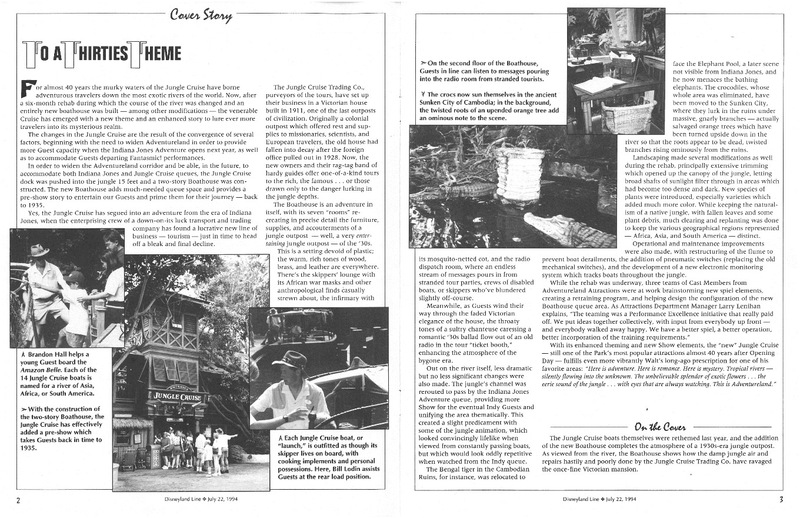 So, without my muddying the waters too much, here is the tale of the Jungle Cruise’s refurbishment from the July 22, 1994 Disneyland Line (Vol. 26, No. 28). “For almost 40 years the murky waters of the Jungle Cruise have borne adventurous travelers down the most exotic rivers of the world. Now, after a six-month refurb during which the course of the river was changed and an entirely new boathouse was built – among other modifications – the venerable Cruise has emerged with a new theme and an enhanced story to lure ever more travelers into its mysterious realm. “The changes in the Jungle Cruise are the result of the convergence of several factors, beginning with the need to widen Adventureland in order to provide more Guest capacity when the Indiana Jones Adventure opens next year, as well as to accommodate Guests departing Fantasmic! performances. 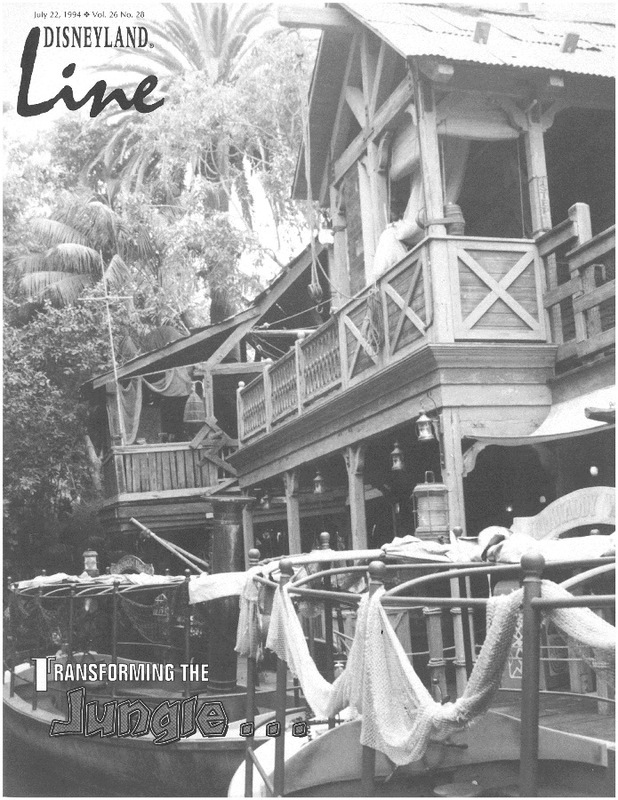 “In order to widen the Adventureland corridor and be able, in the future, to accommodate both Indiana Jones and Jungle Cruise queues, the Jungle Cruise dock was pushed into the jungle 15 feet and a two-story Boathouse was constructed. The new Boathouse adds much-needed queue space and provides a pre-show story to entertain our Guests and prime them for their journey – back to 1935. “Yes, the Jungle Cruise has segued into an adventure from the era of Indiana Jones, when the enterprising crew of a down-on-its luck transport and trading company has found a lucrative new line of business – tourism – just in time to head off a bleak and final decline. 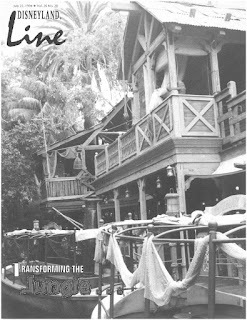 “The Jungle Cruise Trading Co., purveyors of the tours, have set up their business in a Victorian house built in 1911, one of the last outposts of civilization. Originally a colonial outpost which offered rest and supplies to missionaries, scientists, and European travelers, the old house had fallen into decay after the foreign office pulled out in 1928. Now, the new owners and their rag-tag band of hardy guides offer one-of-a-kind tours to the rich, the famous… or those drawn only to the danger lurking in the jungle depths. “The Boathouse itself, with its seven ‘rooms’ recreating in precise details the furniture, supplies, and accouterments of a jungle outpost – well, a very entertaining jungle outpost – of the ‘30s. This is a setting devoid of plastic; the warm, rich tones of wood, brass, and leather are everywhere. There’s a skippers’ lounge with its African war masks and other anthropological finds casually strewn about, the infirmary with its mosquito-netted cot, and the radio dispatch room, where an endless stream of messages pours in from stranded tour parties, crews of disabled boats, or skippers who’ve blundered slight off-course. “Meanwhile, as Guests wind their way through the faded Victorian elegance of the house, the throaty tones of a sultry chanteuse caressing a romantic ‘30s ballad flow out of an old radio in the tour ‘ticket booth,’ enhancing the atmosphere of the bygone era.Out on the river itself, less dramatic but no less significant changes were also made. The jungle’s channel was rerouted to pass by the Indiana Jones Adventure queue, providing more Show for the eventual Indy Guests and unifying the area thematically. The created a slight predicament with some of the jungle animation, which looked convincingly lifelike when viewed from constantly passing boats, but which would look oddly repetitive when watched from the Indy queue. “The Bengal tiger in the Cambodian Ruins, for instance, was relocated to face the Elephant Pool, a later scene not visible from Indiana Jones, and he now menaces the bathing elephants. The crocodiles, whose whole area was eliminated, have been moved to the Sunken City, where they lurk in the ruins under massive, gnarly branches – actually salvaged orange trees which have been turned upside down in the river so that the roots appear to be dead, twisted branches rising ominously from the ruins. “Landscaping made several modifications as well during the rehab, principally extensive trimming which opened up the canopy of the jungle, letting broad shafts of sunlight filter through in areas which had become too dense and dark. New species of plants were introduced, especially varieties which added much more color. While keeping the naturalism of the native jungle, with fallen leaves and some plant debris, much clearing and replanting was done to keep the various geographical regions represented – Africa, Asia, and South America – distinct. “Operational and maintenance improvements were also made, with restructuring of the flume to prevent boat derailments, the addition of pneumatic switches (replacing the old mechanical switches), and the development of a new electronic monitoring system which tracks boats throughout the jungle.